As a writer, I don’t deal with charts that often. I work with words, and that’s where I’m most comfortable. But if you’re a project manager or in charge of your team’s task completion, charts are your friend. More than that, you depend on them to keep your work in order. If you’re not comfortable with charts, that could serve as a hindrance to your team’s success. Project management is driven by due dates and task completion, so visualization is imperative to remain organized. One strategy invented specifically for those in the project management industry is the Gantt chart. This strategy serves to increase the consistency with which teams meet their deadlines and hit overall goals. If you’re not used to such tools, the Gantt chart could sound intimidating. 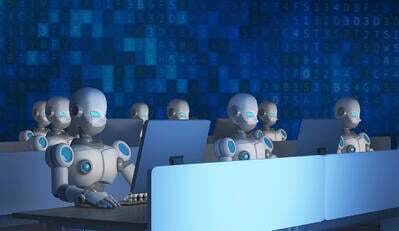 Unfamiliar software is just one challenge for project managers who are already concerned with time management and productivity. However, you have nothing to worry about. I’m a words girl, and I’ve done my research. Here’s everything you need to know to not only understand, but master a Gantt chart. First and foremost, let’s talk about what this strategy is. Gantt charts display the tasks a team has to complete in relation to a project’s timeline. Gantt charts are a scheduling tool used by project managers. Tasks are displayed on the vertical axis, while the amount of time to complete those tasks rests on the horizontal axis. Subtasks and project stages can also be communicated within Gantt charts. Gantt charts have been in existence since the 19th century when Polish engineer Karol Adamiecki invented the concept to help run a steelworks. Henry Gantt, an engineer from the United States, revised and popularized the strategy about 15 years later and, consequently, became the strategy’s namesake. Before modern technology, individuals were tasked with creating Gantt charts by hand. Being that these charts are very involved and require updating every time something changes, you can imagine how time-consuming this process was. Thanks to modern technology, we can significantly speed up this process and create a more efficient method of keeping tabs on our work. If you're interested in discovering other project management methods, learn more about PERT charts here. In order to define Gantt charts, it helps to know how they were originally used. Back in the 19th century, things were different. You couldn’t track a package through Amazon. You couldn’t add tasks to a task management software and have the tool automatically update the time to completion. You couldn’t generate auto reports. Everything was done by hand. Any estimation of how long a project was going to take had to be factored manually. Gantt charts were useful in that they helped organizations and businesses estimate their time to completion or delivery as seamlessly (but not quickly) as the digital counterparts we utilize today. According to a source closely related to the chart’s origins, “The Gantt progress chart enables the manager to keep before him all the promises he has made, to concentrate his attention on overcoming obstacles and avoiding delays, and, when it is impossible to live up to a promise, it enables him to give the customer advance notice of the fact” (Wallace Clark – ref.1). Gantt charts are comparable to bar charts in that they can be read and understood in the same way. They also use visual bars to denote the amount of time occupied performing a certain task. In fact, some will use the terms Gantt Chart and bar chart interchangeably. Consider the example below of an older Gantt chart, which looks something like a bar chart turned on its side. Old-fashioned Gantt charts and modern Gantt charts differ in setup. In older versions of the chart, the list might have been on the left with a separate calendar to the right communicating the months each step would take to complete. 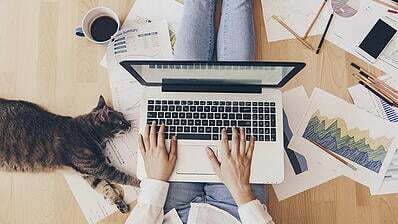 To show if tasks are related or dependent from one another, the start of one task might be drawn immediately following the end of a previous task. In more modern, digitally-created versions of Gantt charts, there’s no need to separate the two components. Tasks can be laid out underneath their corresponding dates with the title of the task adjacent to the bar. Should I use a Gantt chart? Gantt charts have a lot of varying pros and cons. Here, you can discover the benefits and disadvantages of this particular project management methodology. Gantt charts provide many benefits. The following are only a few to consider. 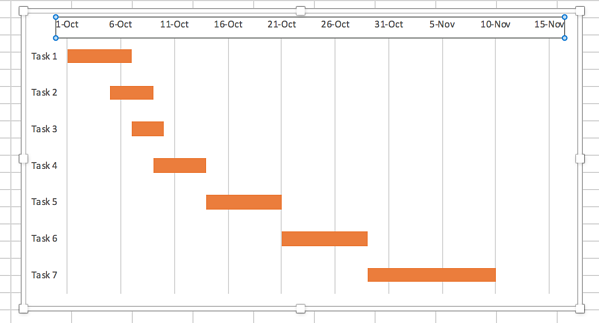 As mentioned earlier, some Gantt charts give the ability to see team members’ availability. This prevents employees from getting double-booked on two projects at once. Gantt charts also help clarify dates certain assignments or aspects of a project are due. If your team is having trouble keeping dates straight, a Gantt chart might be for you. Some Gantt charts have features that allow users to communicate within a solution. This allows questions to be answered immediately, as opposed to having employees wait days for email responses. With digital Gantt charts, it’s simple to edit dates and tasks to reflect changing circumstances, meaning your team isn’t necessarily locked into anything that needs to change. Gantt charts give you an overall picture, as opposed to showing one isolated aspect of a project. These charts clarify an entire team’s role in a project. Gantt charts ensure things are rolling along smoothly by tracking the time it takes to complete certain tasks. With a Gantt chart, everything is on a deadline. Ideally, this helps your team keep moving and reduced the amount of lag time between tasks and subtasks. Gantt charts aren’t just a project management tool – they’re also a task management tool. That means they can replace many of your day to day tasks, such as meetings or morning stand-ups. Gantt charts are also motivating, as colleagues can see each others’ progress and be inspired to do the same. Project managers can’t and shouldn’t do everything. With a Gantt chart, a project manager knows how to delegate tasks out to their employees. Gantt charts also increase workplace visibility, allowing employees to see what their colleagues are working on. If we’re going to discuss the positives, we very well should discuss the negatives. Some argue that Gantt charts are losing relevance or that they don’t work. One reason cited is their level of complexity. As you’ll see below, it does take quite a few steps to complete one chart. Another issue with Gantt charts is that they simply show the duration of a task, but don’t adequately communicate how much work is needed to be done during that phase. In other words, Gantt charts seem two-dimensional to some. Even further, some argue that they require too many updates. In my opinion, this is true of any project or task management software. As circumstances change, we’re required to update things manually – no matter what tool we’ve chosen. As with any strategy, methodology, or philosophy, it’s up to you to decide if the benefits outweigh the disadvantages. Who uses a Gantt chart? Gantt charts are for everybody! Although they’re marketed toward project managers, they’re beneficial for any professional taking on a project with definable tasks. You could even use one to assist with a personal project, such as the creation of your wedding website, or to help schedule out your next woodworking project. It’s more likely you’ll see Gantt charts used in a professional setting, but there are no limitations to who they could benefit. If you’re wanting to know more about Gantt charts, it’s possible you’re just looking for an example or a good template to get you off the ground. There are plenty of great resources out there to help you get started. Consider this page by Template Lab, which provides 36 Free Gantt Chart Templates in Word, Microsoft, and Excel. Office Timeline offers its own collection of Gantt Chart Templates as well. Varying templates reflect the different styles a user might want to take in creating a Gantt chart. Did you know you can make a Gantt chart in the comfort of your home office or workstation? Hold on to your pants, guys. There are a lot of steps here, but in the end you’ll be a verified chartographer. 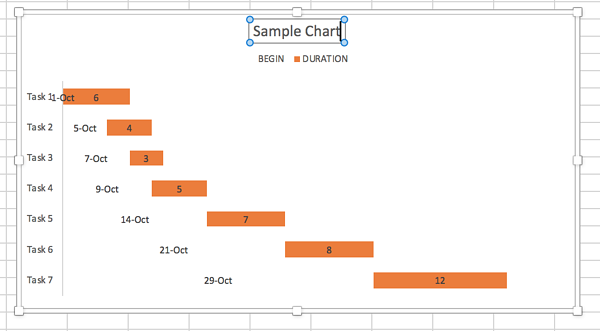 If you’re looking to create a Gantt chart manually (from scratch), follow these instructions. Create the task table — To create a Gantt chart, you’re going to work with four elements: the task name, beginning date, task duration, and date of completion. 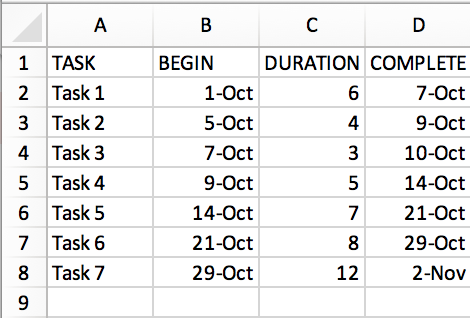 Create a table in Excel that covers all of these bases. In the example below, I’ve used, “Task 1, Task 2, etc.,” as generic task titles. Some of the tasks overlap in time, and some do not. The tasks should be listed in order with the earliest start date coming first and the latest start date appearing last. Create a bar chart — At the top of Excel, find the menu tab that says, “insert.” Click this icon. Then click on the bar icon. From the list that follows, select the stacked bar chart. It is the one highlighted in the image below. 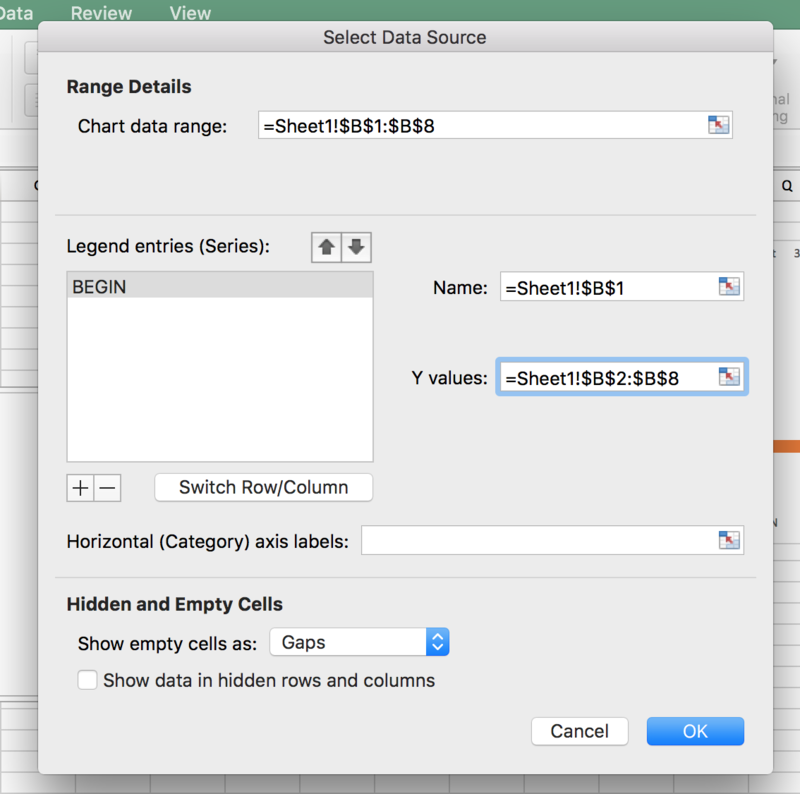 Be sure your mouse is in an empty cell on the sheet before creating the chart. 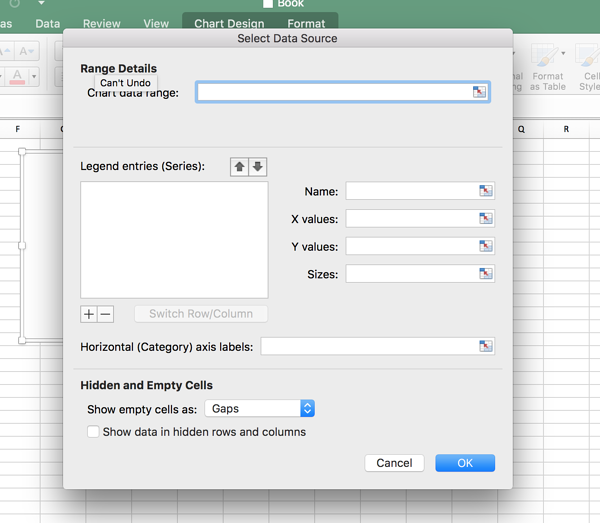 Selecting this feature will pull a blank bar chart onto your Excel spreadsheet. Add data — Toggle your mouse over this blank bar chart and right click. Find, “select data,” and click. This opens up the, “select data source,” window. From here, you’ll have to choose and submit the chart data range. Start by clicking on the plus sign under the, “legend entries (series),” box to begin adding data. In a different version of Excel, you may click the word, “add,” instead of an addition sign. Once you’ve clicked the plus sign, a generic series will appear. First, name the series. Click in the, “name,” box. While your cursor is still there, click on, “begin,” or whatever title you’ve used to determine the start date column. Next, insert the Y values. Click on the box that says, “y values.” Clear the default data box and click into it. While the cursor is still over the box, hover and highlight the range of dates in the, “begin,” column. When the dates are highlighted, it will look as below. Now that you’ve taken care of the beginning column, it’s time to tackle duration. Begin by adding a new series. You can do this by clicking the plus sign or pressing, “add,” just as you did for the, “begin,” range. After you’ve done this, you’ll have two series’. Now, address the horizontal axis. 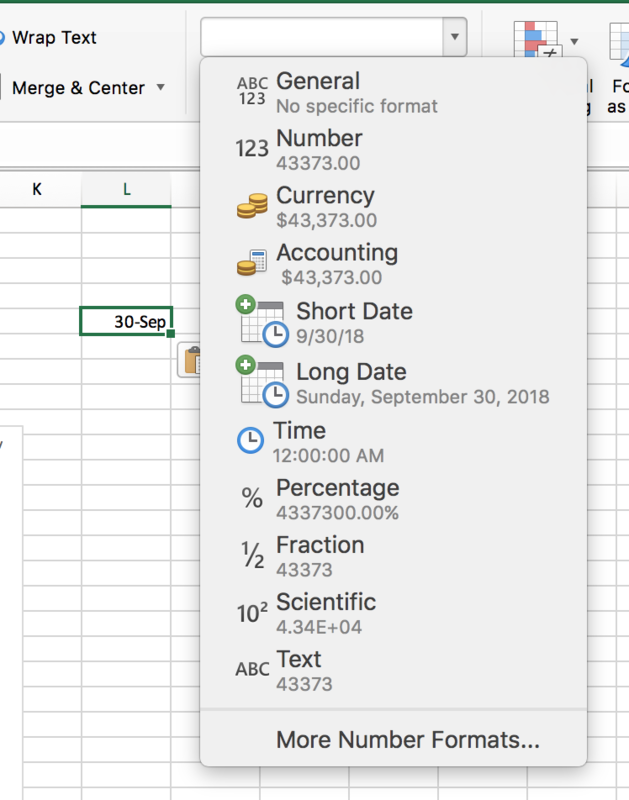 Click on the bar labeled, “horizontal (category) axis labels,” just like you clicked into, “name,” and, “Y values.” Navigate over and highlight all of your task names. Once you release your mouse, the task names should be added to the data source window. Press, “Ok,” to indicate you’re done adding data. You should now have a premature version of what we will further edit to create a Gantt chart. 4. Edit the chart — As you can see, the tasks are listed on the left from last to first. Let’s change this so the chart reflects how we would naturally read it. This will adjust the chart so tasks work from beginning to end. Next, we need to get rid of everything on the graph that doesn’t serve a purpose. The blue bars don’t represent anything necessary to your organization, so we can get rid of them. After this, your graph should no longer be displaying the blue filler bars. As you can see, we’ve now created an issue of having too much white space on the chart. We really only need to be able to see the tasks themselves. To change this, let’s edit the date range on the chart. When you’re working in Excel, dates are understood not as month, day, and year, but as numbers in the thousands. Let me explain. 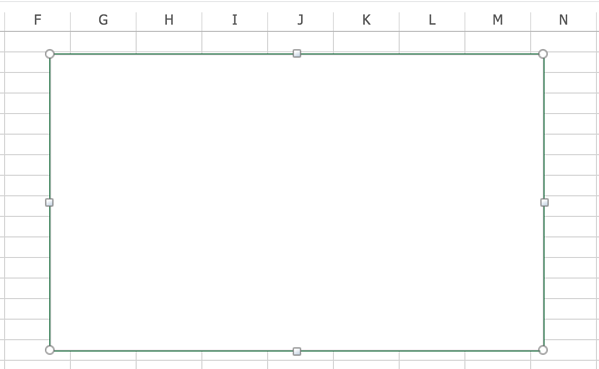 Click on an empty cell in Excel and type in the beginning date of your project. For example, the date I choose was Oct. 1. Highlight the cell and find the dropdown menu at the top of the screen labeled, “custom.” Find where it says, “number,” and select this. The cell now changes from 1-Oct to 43374.0. Keep this in mind as I show you why it matters. Go back to your chart and click on the dates, just like you’ve clicked on the tasks and blue bars. 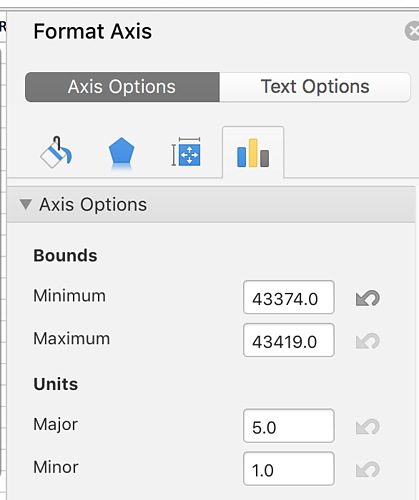 Right click and find, “format axis.” Underneath, “axis options,” you’ll find boxes containing the minimum and maximum bounds of the chart. You’ll be changing the minimum to the number that corresponds with the date your project starts. In this instance, I find the number corresponding to Nov. 10 and put it as the maximum axis boundary. Looks better, doesn’t it? And guess what? You’re done! You can now move on to customizing or formatting your chart in any way you choose. Below is just one example of the way you could format your chart, with a title and varying information on the axes. As you can see, creating a Gantt chart within Excel is a time-consuming process. With some practice, you’ll have it down in no time and can create these kinds of visuals in your sleep. However, if you want to save yourself some time and sanity, know that there are tools out there to help you. Let’s discuss some of the ways technology can help you quickly and efficiently create a Gantt chart. The first is by exploring and investing in project management software with Gantt chart capabilities. 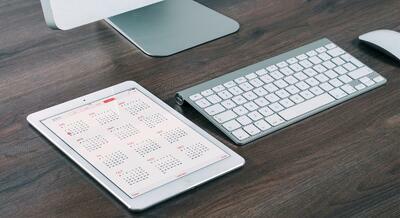 Project management software gives you an all-inclusive experience scheduling and overseeing projects. It helps with goals and organization, as well as productivity. Plus, it allows for employees to become more self-sufficient as they manage their own deadlines and workloads. Something else to consider is whether you’d do better with a tool specifically intended to create Gantt charts. These solutions, often referred to as a Gantt chart makers, have fewer features than project management tools. However, the features they do have are specifically designed to help you accomplish Gantt chart creation. Some Gantt chart software makes it as easy as dragging and dropping a chart’s pieces and filling in the required fields. This will generate a chart that is reflective of your project or assignment. Gantt chart tools can generate reports in HTML and PDF formats, import and export data from external sources, and help with time management. If you’re looking for a solution to get you started on making Gantt charts, there are many free Gantt chart solutions! Bitrix24 offers online, on-premise Gantt chart creation as a feature within its software platform. Easy Projects gives you a 14-day free trial to see how you like its drag and drop features. This tool has features that help you not only schedule the work, but assign it based on your employees’ availability. Team Gantt is free for one project, but requires a monthly payment beyond that. This tool allows for team communication within it and helps keep files organized in one central location. ProjectLibre is an award-winning project management tool with Gantt chart capabilities. The company in charge of ProjectLibre aims to make project management a solution that all can afford and/or use. Wrike project management software is free for the first five users. Beyond that, teams pay in monthly packages. Gantt charts within Wrike allow for easy adjustment making and changes regarding existing Gantt charts. Gantt charts are only one way to improve your team’s strategies. There are plenty of other software solutions and strategies to look into.